Someone once said, “All is fair in love, war, and #negotiations.” If that’s true #misinformation and #disinformation are armigers that some negotiators use as weapons of mass destruction. In order to best combat misinformation and disinformation in negotiations, you must know the difference between the two before you can address either. The question is, to what degree are you prepared to deal with this type of ploy? Misinformation can be daunting when deciphering the truth. Coupled with disinformation, the truth can become darn near undetectable. Observe the following to make the distinction less elusive. 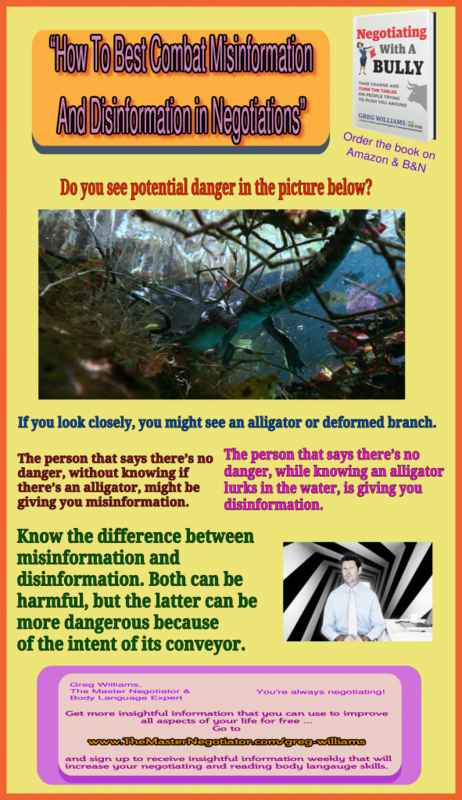 Understand that there’s a difference between misinformation and disinformation. While the distinction between the two may have similar appearances, their usage is what really sets them apart. Misinformation is erroneous information delivered to intentionally or unintentionally alter your thought process. It can also be used as a way to insulate one’s self (e.g. I didn’t mean to misquote that information). Later in the negotiation, that tactic can turn into a trap that detracts from the user’s credibility, if used too frequently. Disinformation is the intentional attempt to spread false information for the purpose of deceiving you. That makes its usage more dangerous in a negotiation. It also speaks to the character of its user. If you know the user’s intent to persuade you, you’ll have insight into which of these modalities he may use to accomplish his objectives. When you know someone’s character, you can more accurately assess and determine their intent. Thus, knowing a negotiator would not venture into the territory of disinformation could lead you to be more understanding if he misquotes information. On the other hand, if you know you’re dealing with a devious individual, one that doesn’t have a relationship with the truth, you’d be wise not to grant him forgiveness when he misquotes information. In such a case, you may have just caught him in a lie that he’s aware of. Let him stew in this dilemma and assess what he does. Doing so will also give you great insight into the possibility of the information being disinformation or misinformation. You can further address the type of information that’s being passed to you by referring to a higher authority that refutes what’s been delivered. You can do this, even if the authority and/or information you cite is not real. It’s called bluffing. After addressing steps 1 and 2, assess the intent of the information that you’ve been given. Do so with the thought of what impact it’s intended to have on you, what actions are you to engage in as the result of the information. Also, consider the timing of its deliverance. If you assess that it’s intended to evoke a particular action or thought, assess what the overall intent might be and where such actions might lead. If you sense that something’s not right, don’t continue. Instead, question what you should be paying more attention to. While misinformation and disinformation may offer challenges during a negotiation, being mindful of how to combat them can lessen their potency. Once you adopt a heightened mindset when dealing with them, your negotiation efforts won’t be fraught with the degree of dismay that otherwise might exist. Thus, by adopting these strategies when dealing with information, you’ll have a better perspective about the information you deal with … and everything will be right with the world. The post “How To Best Combat Misinformation/Disinformation in Negotiations” – Negotiation Tip of the Week appeared first on The Master Negotiator & Body Language Expert.